Whilst creating my interactive map of Romanesque churches in Saône-et-Loire, locating the church of Ozolles appeared to be not as straight forward as I thought it was. The church was mentioned on Eduard van Boxtel's website, and I had assumed the church to be the village church, which seemed perfectly logical. According to van Boxtel however this was not correct. 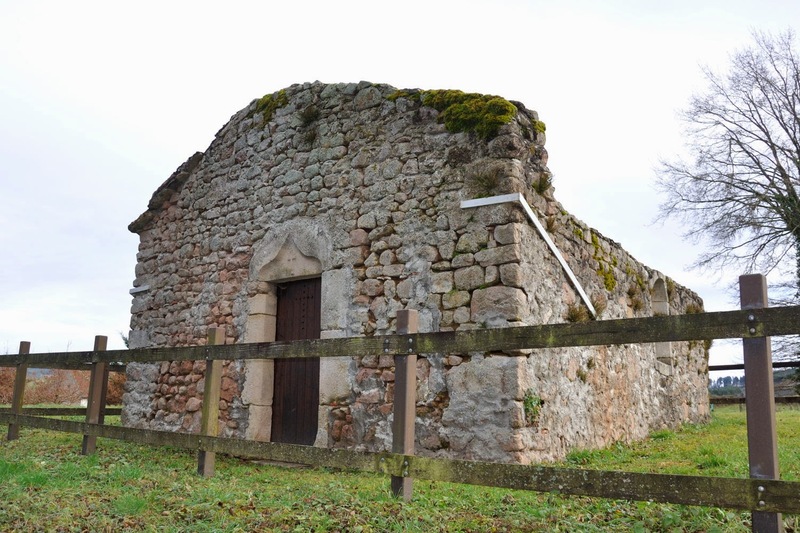 He knew that it was supposed to be a "former church, next to the mairie, in lieu dit St-Martin". Ozolles is not exactly next door for us, hence we decided to wait until we had to go to the Brionnais to see a client. And since we were then in the vicinity, we could look out for that church. Some time ago we had to go to the Brionnais. 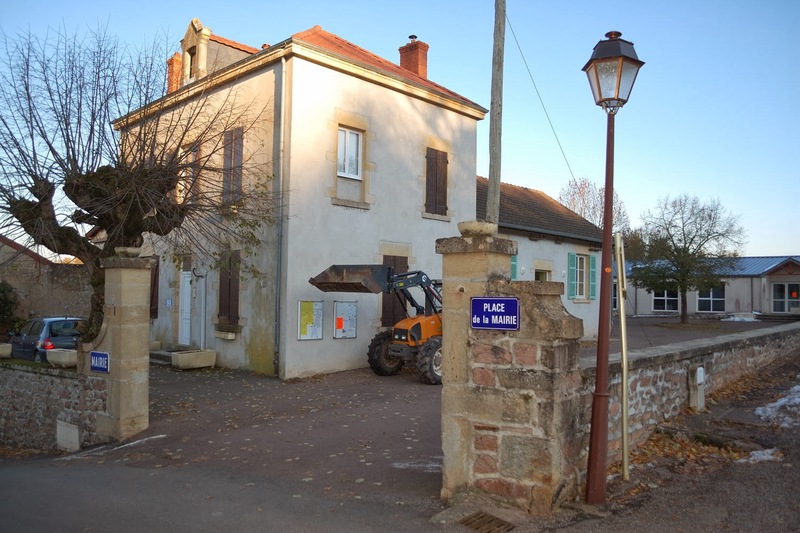 That day we were going to try to locate the church of Ozolles and a chapel in Pomey, a hamlet of Ozolles. 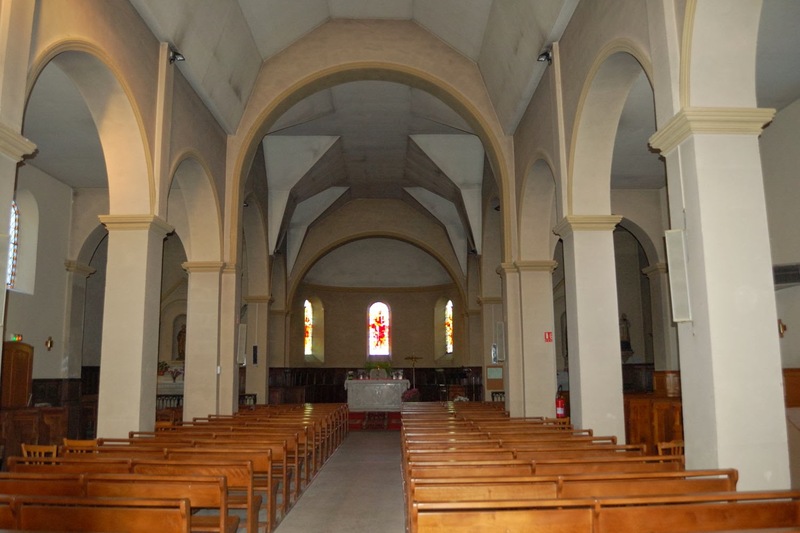 The "new" church in Ozolles was found fairly quickly, not far from the mairie. Around the mairie there was a plot of open land, which possibly once surrounded an old church. 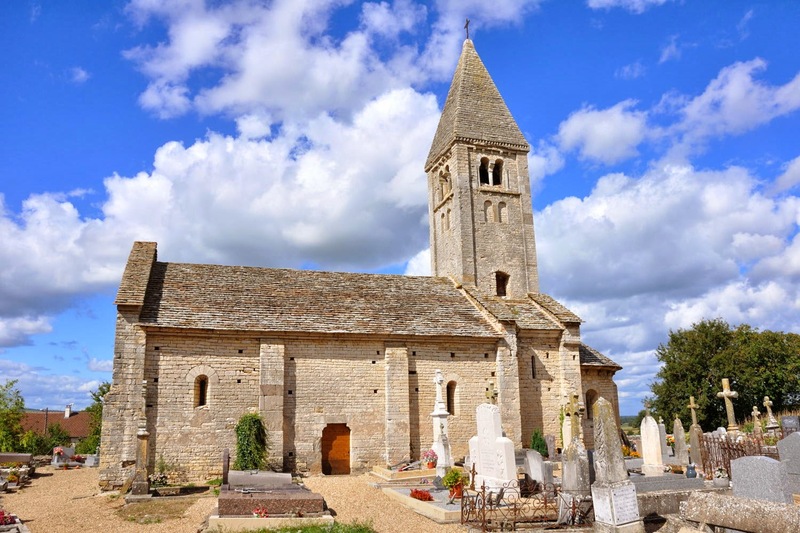 We found somebody walking around the village, but according to this person there was only one church in Ozolles, possibly built on the foundations of its predecessor. The trip to Pomey was not much more successful. Pomey was not shown on the Michelin map, and a sign pointing towards Pomey ended up in a totally different hamlet. After this debacle we put both Ozolles and Pomey on hold. However, the quest was not given up so easily. The next time we went to the Brionnais we came better prepared. 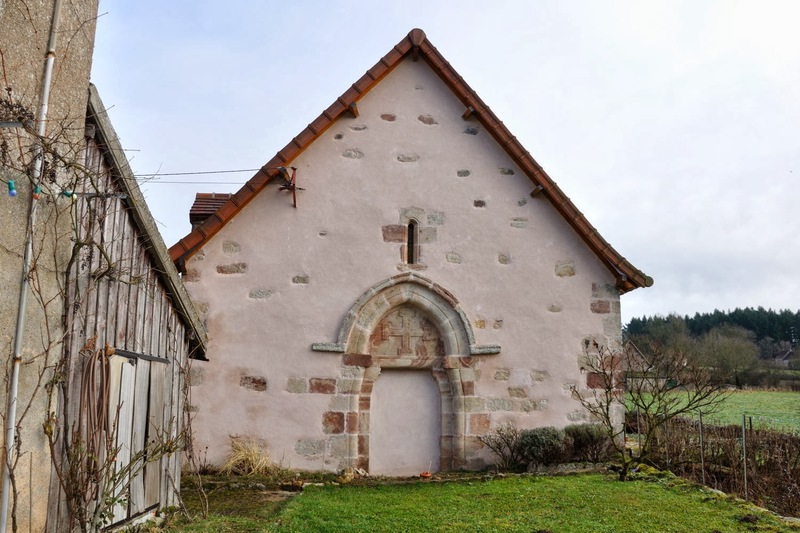 I had received more detailed information from van Boxtel about the Romanesque church in Ozolles. The church was a former church, next to the former mairie, in the former village centre of Ozolles. The old village was centred around Saint-Martin, a hamlet slightly north of Ozolles. The church was one of a cluster of 3 buildings. From one of the other buildings one could clearly see the facade of what once had been a church. In these sort of cases Google Maps as well as the French Geoportail.fr (option IGN maps) gives far better information than Michelin. 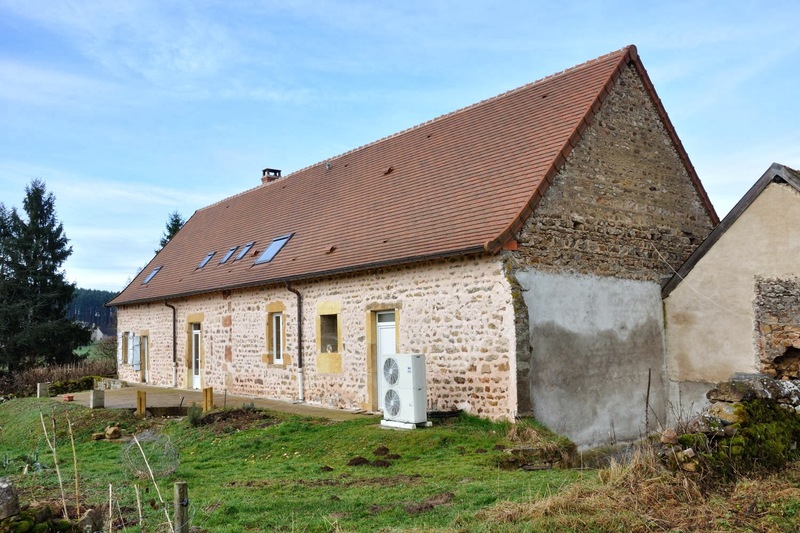 Saint-Martin was quickly spotted, there was only one group of three houses there, and the chapel of Pomey was also well indicated. A screen dump of the map with Saint-Martin resp. Pomey made it quite easy to find both buildings. The former church of Ozolles was easily found. The owner, who was according to van Boxtel's source not very helpful where information about his property was concerned, was not home, the gates were not locked, in a word, nothing or nobody stopped me from making a tour around the property. That was Ozolles out of the way. Pomey turned out to be easy to find with the detailed map I had printed. 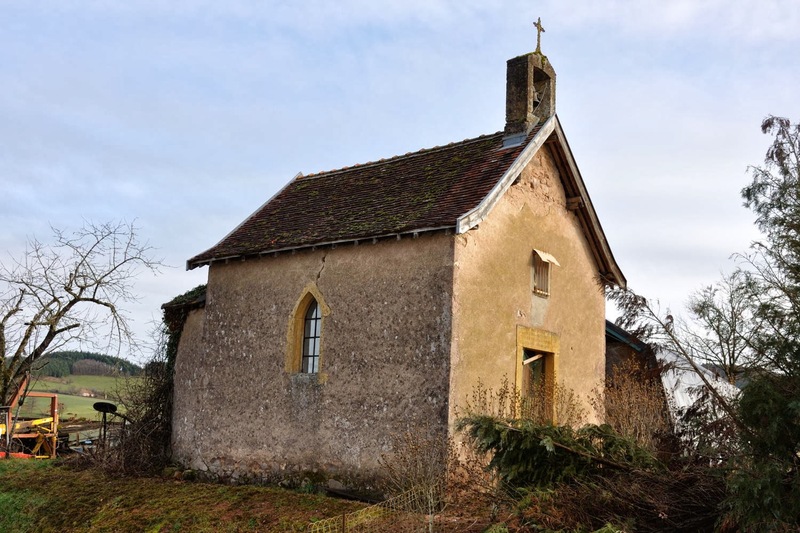 And the first building I encountered whilst entering the hamlet appeared to be a chapel. After having had a good look around I noticed a sign saying that the chapel had been built in 1877; not exactly a year famous for its Romanesque building activities! Studying the map closer showed that the chapel (Chapelle des Blancs) was just a tiny bit further down the road. It was a chapel without a roof, and despite of the lack of cover the chapel still seemed to be in use. There was a primitive altar with a cross, and in front of it stood a simple wooden bench. Despite the fact that these trips are not always as successful as one wishes, one really gets a kick in case the looked for item is indeed found! 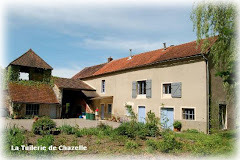 The Brionnais is well worth a daytrip from La Tuilerie de Chazelle. I had visited the church in Ougy (commune of Malay) at least three times, the last two times to make some more detailed pictures of the inside and the outside of the church. 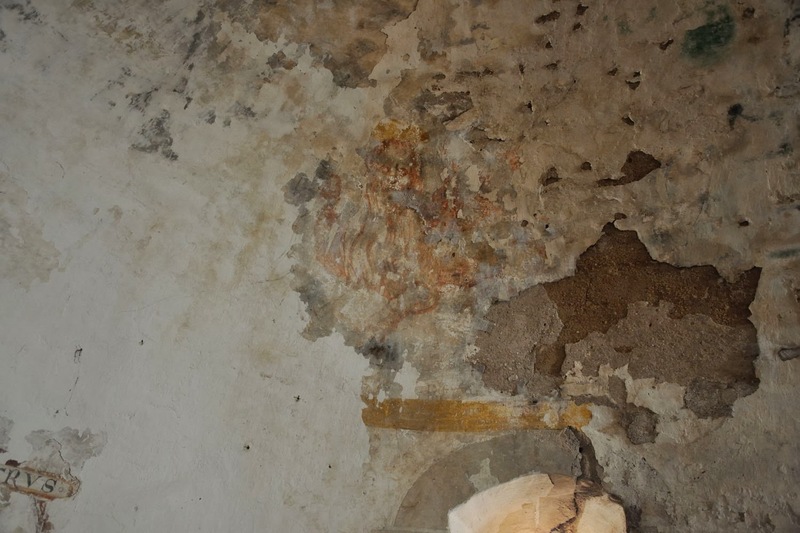 Inside the church itself there are a number of remains of wall paintings, and one of them should depict Philip the Apostle. I had looked a number of times at all the fragments, but I had never spotted someone who could have been Philip. 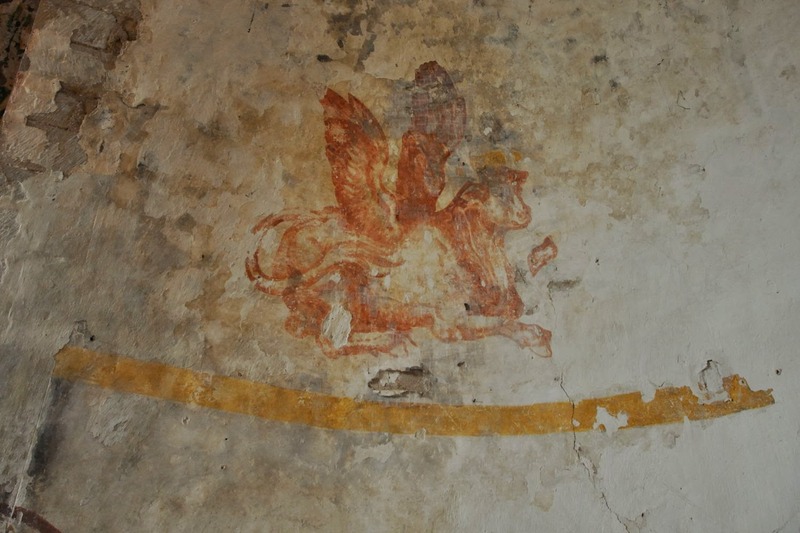 The apse hosts some very vague remains of a Chist in Glory, and a picture of a winged bull (Luke the Evangelist) on the left hand side and of Luke himself on the right hand side. And further there are some remains of a mourning band with the coat of arms of the Family du Blé of Uxelles, the Lords of Cormatin. 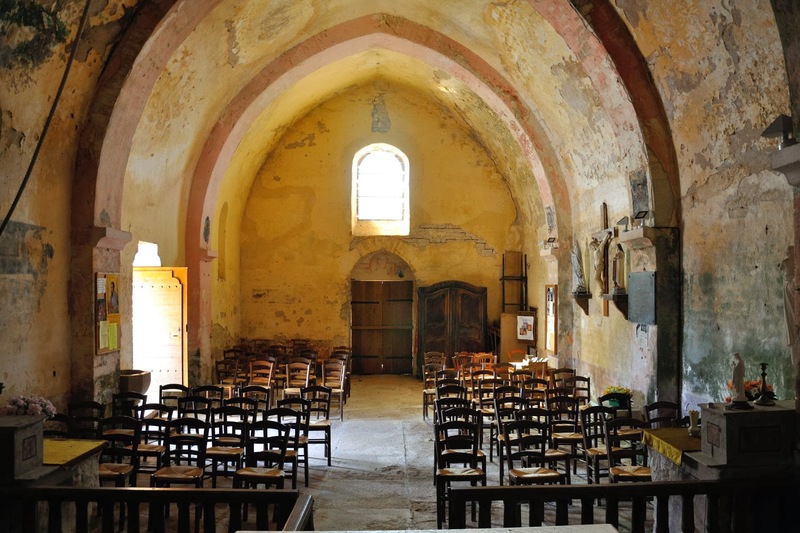 In October 2013 Eduard van Boxtel asked me if I could provide him with a big size photograph of the interior of this church; he wanted to cut out a picture of the fresco of Saint-Philip to his website. And that question woke me up. Indeed, just above the western door, which is always closed, one could distinguish with a bit of effort, in a half circle, a fresco. 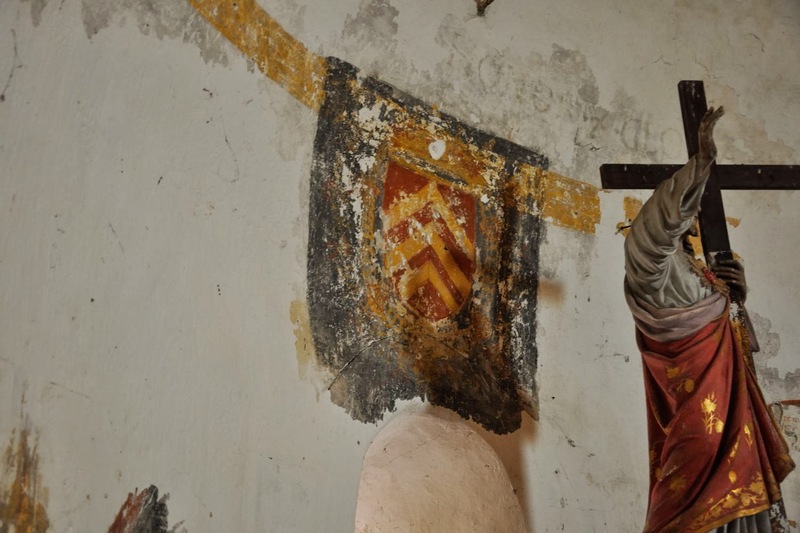 Because the walls of the church have rather suffered a long time from moisture, and were hence pockmarked with stains, the fresco did not look so much different from those stains at a distance. The larger picture was transferred in no time, with a promise that I would pop by the church again to take a proper picture; we quite regularly pass by Ougy anyway. I had never seen this church closed, so it was quite a surprise to find, on Wednesday 6 November, the door locked with a notice pinned upon the door :"Church closed from 4 November to 3 March 2014, except on Saturdays and Sundays". No big deal of course: on Saturday 9 November we were back. However, irrespective of the promise on the notice, the church was closed. Sunday 17 November we had more luck; the side door of the church stood wide open. Even now it was not directly clear what the fresco was all about. The painting is located in a rather dark part of the church, but once my eyes had adjusted themselves to the twilight it was obviously the one I was looking for. Because I prefer to take pictures without flash, and because my partner discovered that the door was not locked but bolted with a beam resting in recesses in the wall, it did not take much time to discover how to unbolt the door which made the fresco perfectly visible. Anyway, shooting some detailed pictures was a doddle, and after that it was just a matter of closing the door and put the beam back into place. In hindsight I could have found the fresco easily on a previous visit. 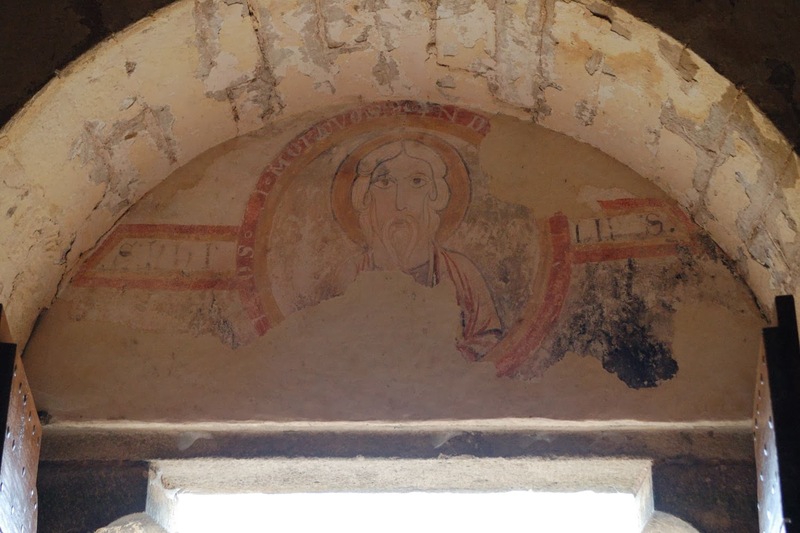 According to a brochure the fresco is located "on the other side of the West portal". This may not be as clear as "inside, above the front door", but for a weathered church spotter the location in the brochure should be clear enough. Which proves again, that he who does not use his brain, will have to resort to using his legs, in my case his car! It takes only 15 minutes by car to get from La Tuilerie de Chazelle to Ougy.